Do we feel fine? With each passing month, the dollar moves closer to becoming what one might call a ‘normal’ currency, in that it is gradually losing the pre-eminent reserve currency status it has enjoyed since the 1920s. In certain months, including that just passed, the end approaches rather more swiftly. While we have always regarded the demise of the fiat dollar as both necessary and inevitable, it is important to understand that, using history as a guide, what lies ahead is highly likely to be some combination of unpredictable, disorderly and even dangerous. But rather than stand as deer in the headlights, investors need to take action to prepare. Most important, they need to diversify away from not only dollar assets, but from fiat currencies and financial assets generally. The dollar has been in focus of late, primarily due to its substantial decline in value versus other currencies and most major commodities. 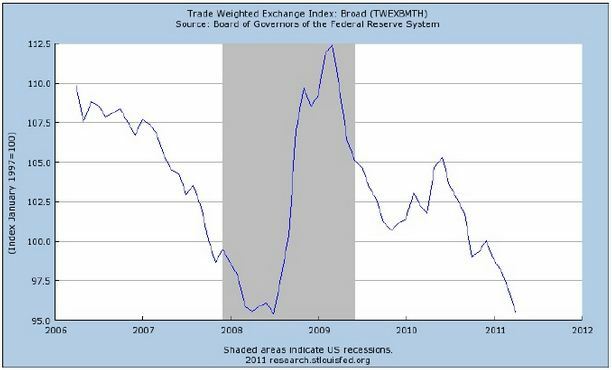 Indeed, when measured in broad, trade-weighted terms, the dollar’s April decline is one of the largest monthly drops of the past decade and extends what has now become the largest cumulative decline since the US economy exited recession in 2009.1 When measured versus a broad basket of global commodities, the recent decline has been even more dramatic. As with many financial market developments, at first glance this might seem rather curious. After all, much headline economic data shows that the US economic recovery has been gaining momentum. The Fed has acknowledged as much and has indicated that its current policy of steady balance sheet expansion, known as ‘QE2’, will end as planned next month, to be followed, presumably, by higher short-term interest rates at some point. Other factors equal, a healthier US economy and higher US interest rates should be dollar supportive. The problem with the sort of analysis above is two fold: First of all, it looks at only one side of an exchange rate, which naturally must have two sides. Second, it implies that headline economic growth and the current level of interest rates are the decisive factors that determine exchange rates in the first place. In the current instance, notwithstanding somewhat stronger headline US economic data of late, for those who care to look behind the numbers, the US economy, by contrast, is showing disturbing signs of major structural weaknesses pointing to dramatically weaker growth in future. And while US interest rates may nevertheless begin to rise at some point, rates are already rising in nearly all the rest of the world and show no signs of peaking given strong growth and soaring inflation throughout much of the global economy. These developments undermine the dollar's pre-eminent reserve currency status. Concern that the dollar might lose this position at some point is a far more important factor in determining exchange rates than incremental changes in relative growth, inflation or interest-rate expectations. So what are these signs of major US structural weaknesses to which we refer?